You may notice a couple tweaks around the blog. The reason? 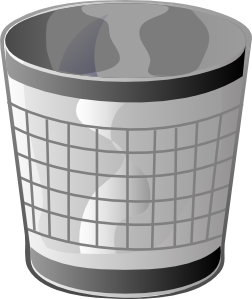 Until further notice, I am tossing Richard Davis, Jon Campbell, and Michael Henson into my mental Bin of Irrelevancy. These three men now join other things that are personally irrelevant to me, such as Windows 98, asparagus, and shag carpeting. I’ve done a good job over the last year explaining why these men aren’t good custodians of the orchestra. At least I’m assuming I’ve done a good job because they’ve never come forward to dispute anything I’ve said, which insinuates that what I’ve said is accurate. The alternative is that they think I should be ignored just because of the platform I use, or because I’m young or poor. But in this day and age, that’s all the more reason to toss them into the bin. So I’m archiving the “Hello, Minnesota Orchestra Management!” entry. I don’t need the answers to those questions. I have all the answers I need. The questions I’m currently asking have literally nothing to do with Minnesota Orchestra management. This feels good. As for the pinned “If you’re just joining us” entry, that’s going as a link under my re-vamped About tab. You guys all know who I am now. This still comes as a huge surprise to me, but I’m beginning to get used to the idea. That introductory entry doesn’t need to be front and center any more. I also tweaked my bio to reflect the fact I’m a lot better known for my writing than for my freelance fiddling career. And ta-da! I can now move forward with a clean slate! I feel like I always did at the start of a new school year. I can practically smell the crayons and erasers. But until then, I am putting the lid on the bin. And I’m doing it gladly. Thanks, Mr. Davis, Mr. Campbell, Mr. Henson, for helping to launch my career! *thumbs up* Couldn’t have done it without you. As for everybody else, I can’t wait to work with you to make exciting things happen this season! Do you have your tickets for the show in November? We’ll get to hear Brahms – beloved Brahms! How blessed we are! What do you want to see in the 2013-14 season, since your ideas will be taken into account by the team planning the shows? Personally, I want to work with young people, and I want to share some music history. If I’m extremely lucky, maybe I can shoehorn some women’s music history into whatever project I undertake. What do you want to do – or see someone else do? As we dry our tears, and mourn what we’ve lost, let’s have a conversation about the future. And so. I hereby decree that my attention and energy will no longer be spent deconstructing. It will be spent reconstructing. The only reason to look back now will be to learn from past mistakes as we move forward. Thank you Emily, for all your great work this past year. What do I want to see in the 2013-14 season? So glad you asked! I would dearly love to hear the Musicians of the Minnesota Orchestra play more contemporary music, especially music by living composers. They are so good at it! There are many I can name, but who first comes to mind is our very own Stephen Paulus, co-founder of the (now) American Composers Forum, and beloved friend and colleague to the music community. He is still in a coma after suffering a stroke 3 months ago. It would be very meaningful to hear his music performed by the great orchestra he worked with for many years. As I am concerned that we may loose a local composer of international status, I would like the MN Symphony to perform something by Stephen Paulus sometime in the near future. He was one of the founders of the Composers Forum. His music is excellent, but his health is not good and I think his family could use all the help they can get. He never mentioned the true circumstances, including artistic control. It was as if he was fed all he needed to know by someone on the board! I feel that NPR has done a disservice by giving him airtime to disinform like this. Would you please use your “pulpit” to spread the word? Your readers who are better informed about the heavy-handed scheming of the board should not let this stand unchallenged. I’d like each program to be a mixture of old favorites and accessible contemporary music. The 1950s and 1960s, when twelve-tone and atonal compositions reigned, turned a lot of people off to the very idea of contemporary music, but nowadays, with young people in particular having more eclectic tastes than the World War II generation (who basically had classical, jazz, and American Songbook pop, period) and with contemporary composers using melody again, some new music might be nice. I’m sure that the young audience that hears rock, hip-hop, American Songbook, country, jazz, neo-folk, world beat, and everything else on stations like the Current, buys Putumayo and movie soundtrack CDs would be receptive to new composers. (Note: It’s been decades since I could count myself among the “youth of today,” but that’s what I’ve observed. I think it would be fantastic to hear many of the orchestra members featured playing concertos. In the spirit of more contemporary music, our family would love to hear Douglas Wright play either the Rota (composed in 1966) or the Tomasi (composed in 1956) trombone concerto! Ann and Lisa have a great idea here. I am also in favor of this. I hope that the Musicians of the MN orchestra can get young school children back into the picture. So many kids missed out last year by not being able to attend the Young People Concerts. As for moving on from the past, I say YES! I hope I will finally meet you in November…. Hi Emily! I have really enjoyed reading your blog! What would I like to see? I would love to see LoMoMo (and eventually MOA) do a concert specifically geared toward middle and high school age students – something on par to Inside the Classics. These popular concerts (before being axed by the evil axis) were, in my humble opinion, the very best way to get young adults (and old adults, too) to make a connection with classical music. Start with something they know and build a bridge to a new music experience. :) Thanks to Sam and Sarah, these concerts were education at it’s finest. I’m in the “trenches” with this age group day in and day out as a middle school orchestra teacher and these little terrors truly love classical music. In fact, I did an online survey with my 275 orchestra students and 15% listed classical music as their favorite kind of music. What? Factor in orchestral movie soundtracks and the number jumps to 30%. In addition, I post a classical piece to my class feed/blog each Friday called “Music for your iPod” and when I forget, oh do the complaint emails come rolling in! That’s right, these are 11-13 year olds… future concert goers. So much for classical music dying! That is super cool. I love those statistics. I also am curious what role YMM could play in this. I’m sure they could do great things to help! Yet, 7 days later Henson is back on top of your to-scrutinize list. Admit it – the MNO problem is a drug that got you this far, and you’ve just affixed Henson’s face to the bottle. To be fair, I had no clue that bonuses were coming. The alternative was not reporting and that seemed irresponsible. Also, funny story: I’m human, and sometimes I make errors of judgement (such as possibly tossing Henson into the bin too early). Shocking, right?